The results were enough to turn his roommate off to the hobby, but Egelston, a public-school teacher working on a master’s in education, was hooked. He continued to homebrew, buying his supplies from the only place he could find: a winemaking shop in Manhattan’s Little Italy. It was while enjoying the fruits of his hobby in his Brooklyn apartment one day in 1986 that Egelston’s life changed forever—as did, oddly enough, the life of New Hampshire, the slender state set to host the nation’s first presidential primary. Egelston’s sister, Janet Egelston, and her boyfriend visited in 1986. The couple did roving tour promotions for a West Coast rock-music concern and wanted off the road. They were also aware of the fantastic brewpubs starting up on their side of the continent, the sort that made beer in the same vein as Peter Egelston’s homebrew. Wouldn’t it be something to launch a brewpub of their own, one like those on the West Coast? Northampton joined the Commonwealth Brewery in Boston as the only brewpub in New England, never mind Massachusetts. Really, there were perhaps just a dozen in the entire United States, the brewpub boom still about six years off. Peter Egelston left teaching and decamped to Massachusetts to work at the brewpub. And thus was born what has become New Hampshire’s oldest operating small-batch brewpub or brewery. The Portsmouth Brewery launched in 1991 with an approximately 1,000-barrel brewery and an opening-day lineup of Portsmouth Pale Ale, Portsmouth Weizenheimer (a wheat ale), Old Brown Dog (a brown ale), and Black Cat Stout. Unlike with the Northampton Brewery in Massachusetts, there really was no precedent in New Hampshire for the Portsmouth operation. The brewery was the only small-batch operation in the Granite State; one of only two breweries, period, the other being Anheuser-Busch’s mammoth Merrimack plant, which had an annual capacity of 1.8 million barrels. 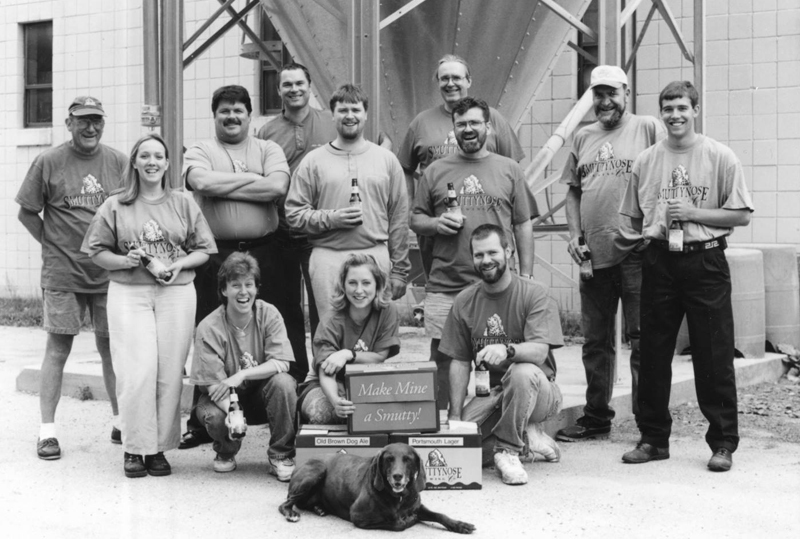 That A-B operation, launched in 1970, had been New Hampshire’s first brewery since 1950. It was in that year that the Portsmouth-based Frank Jones Brewery shuttered. It had been the largest brewery in the state, with roots in the mid-1800s and a branch in Boston. The Frank Jones brand was resurrected from time to time, including in the 1980s and early 1990s. It finally gave up the ghost and the equipment from its last operation went up for auction. Named for a nearby island, Smuttynose’s first releases, on draft and in bottles, were Shoals Pale Ale and that Old Brown Dog (a recipe Peter Egelston first brewed at Northampton in 1989). The brewery would spend more than 20 years in Portsmouth, before in 2015 moving most of its brewing to Hampton, near the border with Massachusetts, where it all began.